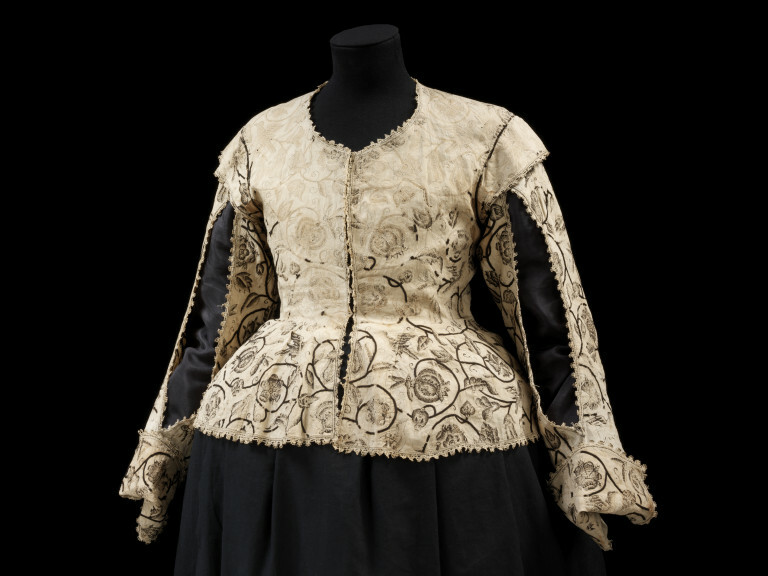 The high waistline and narrow sleeves, open at the front seam, are characteristic of women's waistcoats of the early 1620s. The blackwork embroidery is of exquisite quality and is worked in a continuous pattern throughout the body of the garment. A group of interlocking curling stems enhanced with a garden of roses, rosebuds, peapods, oak leaves, acorns, pansy and pomegranates, with wasps, butterflies and birds, make up the embroidery design. The extremely fine speckling stitches create the shaded effect of a woodblock print. This style of blackwork is typical of the early seventeenth-century and thought to have been inspired by the designs from woodblock prints that the embroiderers were using. The waistcoat is unlined and embellished with an insertion of bobbin lace in black and white linen at the back of each sleeve, and a edging of bobbin lace in the same colours. A woman's waistcoat of linen embroidered in silk thread in speckling, stem and double-plait stitches, and trimmed with bobbin lace of white and black linen. Waistcoats were long-sleeved upper garments, opening down the front and fitted at the waist using inserted gores. This example has a high waist and one-piece shoulder wings. 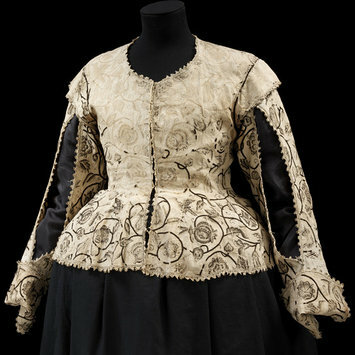 The narrow, curved sleeves are open at the front and trimmed with bobbin lace, and have a bobbin lace insertion at the back, and small turned -back cuffs. The waistcoat is unlined. The embroidery consists of an all-over pattern of scrolling stems, bearing flowers - roses, pomegranates, pansies - as well as pea-pods, pomegranates, acorns and oak leaves, and also birds, wasps and butterflies. The high waistline and narrow, open sleeves indicate a date of 1620-25. Although acquired in 1935, this waistcoat also belongs ot the Isham collection. It was 'exchanged' in 1935 for a blue velvet and silver lace saddle cloth and a pair of holsters thta were part of he Isham collection purchased in 1899.